Fallout: A Post Nuclear Role Playing Game is an open-world turn-based role-playing video game developed and published by Interplay Productions in 1997. The game has a post-apocalyptic and retro-futuristic setting, in the aftermath of a global nuclear war in an alternate history timeline mid-22nd century. The protagonist of Fallout is an inhabitant of a Vault, long-term shelters, who is tasked to find a replacement Water Chip and save their Vault. Fallout is considered to be the spiritual successor to the 1988 role-playing video game Wasteland. It was initially intended to use Steve Jackson Games' system GURPS, but Interplay eventually used an internally developed system SPECIAL. The game was critically acclaimed and a financial success. It was followed by a number of sequels and spin-off games, the Fallout series. Gameplay in Fallout centers around the game world, visiting locations and interacting with the local inhabitants. Occasionally, inhabitants will be immersed in dilemmas, which the player may choose to solve in order to acquire karma and experience points. Fallout deviates from most role-playing video games in that it often allows the player to complete tasks in multiple ways, allowing solutions that are unconventional or contrary to the original task, in which case the player may still be rewarded, or earn an unconventional reward. The player's actions and/or inaction dictates what future story or gameplay opportunities are available, and ultimately dictates the ending of the game. Players will encounter hostile opponents and – if such encounters are not avoided using stealth or persuasion – they and the player will engage in turn-based combat. Excepting conversations with non-player characters, non-combat portions of the game are played in real time. Combat in Fallout is turn-based. The game uses an action-point system, wherein each turn, multiple actions may be performed by each character until all points in their pool have been expended. Different actions consume different numbers of points, and the maximal number of points that can be spent is determined by a character's total agility statistic and modifying elements such as chems (which are temporary) and perks (which are permanent). "Melee" (hand-to-hand) weapons typically offer multiple attack types, such as "swing" and "thrust" for knives. Unarmed attacks offer many attack types, including "punch" and "kick". Players may equip at most two weapons, and the player can switch between them at the click of a button. The "perception" attribute determines characters' "sequence" number, which then determines the order of turns in combat; characters with a higher statistic in this attribute are placed at an earlier position in the sequence of turns, and subsequently get new turns earlier. Perception also determines the maximal range of ranged weapons and the chance to hit with them. A diverse selection of recruitable non-player characters (NPCs) can be found to aid the player character in the post-apocalyptic wasteland. Examples include Ian, an experienced traveler and gunman, who can use pistols and submachine guns; and Dogmeat, a dog the player may recruit in Junktown by either wearing a leather jacket or feeding the dog an iguana-on-a-stick. Unlike Fallout 2, there is no limit to the number of NPCs that the player may recruit, and NPCs' statistics and armor in Fallout remain unchanged through the entire game; only their weapons may be upgraded. The protagonist is governed by the system called S.P.E.C.I.A.L (an acronym for "Strength, Perception, Endurance, Charisma, Intelligence, Agility and Luck"), designed specifically for Fallout and used in the other games in the series. The player begins Fallout by selecting one of three characters to play as the protagonist, or alternatively, they can create one with custom attributes using the system. Character development is divided into four categories: attributes, skills, traits, and perks. These have been copied or otherwise adapted in some form or another through the ensuing iterations of the series. Strength, perception, endurance, charisma, intelligence, agility and luck are the seven basic attributes of every character in the game. The SPECIAL stats continually add bonuses to skills. This is done automatically, i.e. if the SPECIAL stats change, the bonuses are instantly adjusted. Some "perks" and coded events within the game require that the player has a certain level of particular SPECIAL stat before accessing it. There are 18 different skills in the game, ranging in value from 0 to 200%. The starting values for Level 1 skills are determined by the player's seven basic attributes, and most initially fall within the range of 0 to 50%. Every time the player gains a level, skill points are awarded, which can be used to improve the character's skills. The player may choose to tag three skills that will improve at twice the normal rate and receive a bonus at the start. Skills are divided into three categories: combat, active and passive. Books, although scarce in the early game, can be found throughout the game world and permanently improve a specific skill when read. However, after a skill reaches a certain level, books no longer have an impact. Some NPCs can also improve skills by training. Some skills are also improved by having certain items equipped. For instance, a lockpick improves lock-picking skills. Stimulants can also temporarily boost a player's skills, however, they often have adverse effects such as addiction and withdrawal. Traits are special character qualities that can have significant effects on gameplay. At character creation, the player may choose up to two traits. Traits typically carry benefits coupled with detrimental effects. For example, the trait "small frame" improves agility by one point, but negatively affects maximal carrying capacity. Once a trait is chosen, it is impossible to change, except by using the "mutate" perk, which allows a player to change one trait, one time. Perks are a special element of the level-up system. Every three levels (or every four if the player chooses the "skilled" trait), the player is presented with a list of perks and can choose one to improve their character. Perks grant special effects, most of which are not obtainable through the normal level-up system. These include letting the player perform more actions per round or being able to heal wounds faster. Unlike traits, perks are purely beneficial; they are offset only by the infrequency with which they are acquired. The game also tracks the moral quality of the player character's actions using a statistic called "karma", as well as a series of reputations. Karma points are awarded for doing good deeds and are subtracted for doing evil deeds. The player character may receive one of a number of "reputations", which act like perks, for meeting a certain threshold of such actions or for engaging in an action that is seen as singularly and morally reprehensible. The effect of both karma and reputations is subtle, altering the reactions of some NPCs in game altering ways (for example, the player may complete a quest, but not receive the greatest possible reward due to their low karma). Fallout is set in a timeline that deviated from between the end of World War II and the start of the Apollo program, where technology, politics, and culture followed a different course. While technology advanced, cultural and societal progress stagnated, giving the general world a Raygun Gothic appearance with advanced technology. In the mid-21st century, a worldwide conflict is brought on by global petroleum shortage. Several nations enter Resource Wars over the last of non-renewable commodities, namely oil and uranium from 2052 to 2077. China invades Alaska in the winter of 2066, causing the United States to go to war with China and using Canadian resources to supply their war efforts, despite Canadian complaints. Eventually, the United States violently annexes Canada in February 2076 and reclaims Alaska nearly a year later. After years of conflict, on October 23, 2077, a global nuclear war occurs. It is not known who strikes first, but in less than two hours most major cities are destroyed. The effects of the war do not fade for the next hundred years, and as a consequence, human society has collapsed leaving only survivor settlements barely able to eke out a living in the barren wasteland, while a few live through the occurrence in underground fallout shelters known as Vaults. One of these, Vault 13, is the protagonist's home in Southern California, where the game begins in 2161, 84 years after the war. Max Stone, the largest person in the Vault, known for his strength and stamina, but lacking intelligence. Each of the three characters presents either a diplomatic, stealthy or combative approach to the game. Games set later in the Fallout series refer to the player's protagonist as "the Vault Dweller". Official canon states that the Vault Dweller was male, but his name is unspecified. The player is allowed to recruit four companions to aid them in their quest – Ian, a guard in Shady Sands, Tycho, a desert ranger in Junktown, Dogmeat, a dog in Junktown that was formerly pet of a man who bore a great resemblance to Max Rockatansky, and Katja, a member of the Followers of the Apocalypse, living in the remains of Los Angeles (now known as the Angels' Boneyard). Other characters in the game include Aradesh, the leader of Shady Sands, Killian Darkwater, the mayor of Junktown, the Master, the leader of the super mutant army, and Morpheus, his right hand as the leader of the Children of the Cathedral. In Vault 13, the Water Chip, a computer chip responsible for the water recycling and pumping machinery of the vault, malfunctions. With 150 days before the Vault's water reserves run dry, the Vault Overseer tasks the protagonist, the Vault Dweller, with finding a replacement. They are given a portable wristwatch-like computer called the "Pip-Boy 2000" that keeps track of map-making, objectives, and bookkeeping. Armed with the Pip-Boy 2000 and meager equipment, the Vault Dweller is sent off on the quest. The Vault Dweller has free rein across the Fallout world to travel where they wish and do what they like, but later games in the series clarify what the Vault Dweller canonically did. The Vault Dweller travels to Vault 15, the closest known Vault that may be able to provide help, but finds it collapsed into ruins and abandoned. The survivors of Vault 15 have founded a town named Shady Sands, and the Vault Dweller is given the option to defend them from the Khans, a group of raiders that attack the town, and radscorpions, mutated scorpions that plague the town's herds. The Vault Dweller then travels south to Junktown, where they can help the mayor, Killian Darkwater, bring the corrupt casino head Gizmo to justice, or help Gizmo assassinate Killian to take over the town. Further south the Vault Dweller finds The Hub, a bustling merchant city, where the Vault Dweller has the option to hire water caravans to aid Vault 13 and extend their estimated survival by 100 days. With clues from the Hub, the Vault Dweller travels to Necropolis, a city of mutated humans called ghouls who are under occupation by large mutated humans, dubbed Super Mutants. Under the city, the Vault Dweller finds Vault 12 and recovers a water chip. Upon returning with the chip, the Vault is saved, but the Overseer is concerned about the Vault Dweller's reports of the Super Mutants. Believing the mutations are too widespread and extreme to be natural, and that they pose a threat to the Vault, the Overseer charges the Vault Dweller to find the source of the mutations and stop them. The Vault Dweller finds and joins the Brotherhood of Steel - remnants of a top-secret genetic research program involving the U.S. Army that survived the war, and continues to research advanced technology. The Brotherhood supplies the Vault Dweller with equipment and information on the Super Mutants, which so happen to be directly related to the genetic research they conducted before the war: a mutagen called the Forced Evolutionary Virus, which can be used to mutate humans into Super Mutants, but leaves all such mutants sterile as a side effect. The Vault Dweller travels to the Boneyard - the ruins of Los Angeles - and finds out that the cult-like Children of the Cathedral operating around the Wasteland are a front created by the Super Mutants' Master, who is using the Children to preach his message to wastelanders and get them to submit to him peacefully. The Vault Dweller explores the Cathedral of the Children and finds a prototype Vault beneath it, from which the Master commands his Super Mutant army. Disguised as one of the Children, the Vault Dweller infiltrates the Vault and destroys the Master. The Vault Dweller travels north to a military base, where the Super Mutant army was using the Forced Evolutionary Virus to mutate humans into Super Mutants, bolstering their numbers. The Vault Dweller destroys the base, stopping the creation of more Super Mutants and splintering their army. The Vault Dweller returns to the Vault and is greeted at the entrance by the Overseer. The Overseer is happy that the Vault's safety is secured, but fears the Vault Dweller's adventure has changed them, and that hero worship of them in the Vault may encourage others to leave. For the greater good of the Vault and to preserve its isolation, the Vault Dweller is exiled into the Wasteland. If the Vault Dweller does not return to the Vault with the Water Chip before the Vault's water reserves run out, the player loses the game. In earlier versions of the game, if the Vault Dweller did not destroy the military base and the Master before 500 days passed, the mutants found Vault 13 and invaded it, resulting in an automatic loss. This time limit is shortened to 400 days if the Vault Dweller hires water caravans from the Hub, as the caravans traveling to the Vault allow the Super Mutant scouts to find more easily. The 1.1 patch, and subsequent re-releases of the game, extend this time limit to 13 years, effectively giving the player enough time to do as they wish. There is also an optional alternate ending triggered if the Vault Dweller has a negative reputation or the "Bloody Mess" trait, where after the Overseer exiles him, the player character shoots and kills him. At various points of the game, the Vault Dweller also has the choice to join the Super Mutants, which results in a small video showing the Super Mutants rampaging through the Vault and ending the game. In early 1994, Interplay Entertainment announced that they had acquired the license to create video games using the GURPS role-playing game system. Fallout was then created by Interplay as a spiritual successor to their 1988 post-apocalyptic role-playing game Wasteland. Although it was initially developed as an official sequel, Interplay did not have the rights to Wasteland at that point. The budget for the game was approximately US$3 million. In the early stages of planning, other settings based on the GURPS role-playing game handbooks were considered, including a time-travel theme with aliens and dinosaurs. According to producer Tim Cain, "[They] actually worked with the game designer who [wrote] the 'GURPS Time Travel' manual and worked out a complete time-travel adventure, but it was just too much artwork for [them] to get done in a reasonable amount of time." The game's working titles included GURPS: Wasteland and Vault 13: A GURPS Post-Nuclear Adventure. The final title Fallout was suggested by the Interplay boss Brian Fargo. Tim Cain created the game engine and most of the design for the game. He worked on it, by himself, developing the mechanics of the design and incorporating the GURPS system, but that deal fell through. According to IGN, this was due to GURPS licensor Steve Jackson Games objecting to the excessive amounts of violence and gore included in the game, forcing Interplay to change the already implemented GURPS system to the internally developed SPECIAL system. According to Steve Jackson Games, this was a decision taken by Interplay, with no reason given. Cain said that they "all loved X-COM" and that the original version of Fallout (known as Vault 13, before the game was redesigned after they lost the GURPS license) featured combat very similar to the battles in UFO: Enemy Unknown. The gaming media of the time also commented on the strong similarity to X-COM. Cain worked with fellow employees at Interplay in their spare time, starting in 1994. He built the engine alone in six months, given no money and no resources, only time. Later, Cain assembled a team of 30 people to work on the game for the next three years. The game was nearly canceled after Interplay acquired the licenses to the Forgotten Realms and Planescape Dungeons & Dragons franchises, but Cain convinced Interplay to let him finish the work on his project. Later, after the success of Diablo, Cain successfully resisted the pressure to convert the game to multiplayer and real-time based. The game was purposely balanced so that, while the sidequests are optional to progressing the main story, characters who did not improve their skills and experience by completing sidequests would be too weak to finish the game. To create the detailed talking heads, a sculptor built heads of clay, which the artists studied to determine which parts should be most heavily animated. The heads were digitized using a Faro Space Arm and VertiSketch, with LightWave 3D used for geometric corrections, while the texture maps were created in Adobe Photoshop. A number of well-known actors were cast as voice-talents. The game's narrations were performed by Ron Perlman, and the prologue featured one of the foremost iconic catchphrases of the game series: "War. War never changes"; Perlman was re-invited to narrate several later Fallout games. Other appearances included Richard Dean Anderson as Killian, David Warner as Morpheus, Tony Shalhoub (credited as Tony Shalub) as Aradesh, Brad Garrett as Harry, Keith David as Decker, Richard Moll as Cabot, and Tony Jay as The Mutant Lieutenant. Interplay intended to use "I Don't Want to Set the World on Fire" by The Ink Spots for the theme song, but could not license the song because of a copyright issue. This song was later licensed by Bethesda for Fallout 3. The song "Maybe" by the same artists was used instead for the original Fallout theme song. At one point in Fallout's development, in Junktown, if the player aided local sheriff Killian Darkwater in killing the criminal Gizmo, Killian would take his pursuit of the law much too far, to the point of tyranny, and force Junktown to stagnate. However, if the player killed Killian for Gizmo, then Gizmo would help Junktown prosper for his own benefit. The game's publisher did not like this bit of moral ambiguity and had the outcomes changed to an alternate state, where aiding Killian results in a more palatable ending. Fallout ultimately "took just under 4 years to make", according to Tim Cain. The game was released on October 10, 1997. Fallout draws much from 1950s pulp magazines, classic science fiction films such as Forbidden Planet and superhero comics of Atomic Age: computers use vacuum tubes instead of transistors; energy weapons exist and resemble those used by Flash Gordon. Fallout's menu interfaces are designed to resemble advertisements and toys of the time period; for example, the illustrations on the character sheet mimic those of the board game Monopoly, and one of the game's loading screens is an Indian-head test pattern. There are also many references to various works of post-apocalyptic science fiction, such as Mad Max and Radioactive Dreams. One of the first available armors is a one-sleeved leather jacket that resembles the jacket worn by Mel Gibson in Mad Max 2: The Road Warrior. The player can also get a dog, as in Mad Max 2 and A Boy and His Dog, named Dogmeat. Fallout contains numerous Easter eggs referencing 1950s and 1960s pop culture. Many of these can be found in random encounters, which include a vanishing TARDIS from Doctor Who (complete with sound effect), an enormous reptilian footprint, and a crashed UFO containing a painting of Elvis Presley. The game also refers to other pieces of fiction, including WarGames and Blade Runner. Although the time frame of Wasteland is completely different from Fallout – and despite the fact that the game's designers deny that the Fallout franchise takes place in the same universe as Wasteland – there are many references to the events and the style of Wasteland in the Fallout series, which is why Fallout is sometimes regarded as a spiritual successor to Wasteland. For example, the protagonist can meet an NPC named Tycho, who mentions that he is a Desert Ranger and, under the right conditions, will talk of his grandfather, who told him about Fat Freddy, a character from Las Vegas in that game. The game, along with its two follow-ups, Fallout 2 and Fallout Tactics: Brotherhood of Steel, were later sold together as part of the Fallout Trilogy. Fallout and Fallout 2 also appeared together in "dual jewel" format. Fallout was a commercial success. In the United States, it debuted at #12 on PC Data's computer game sales rankings for October 1997. A writer for CNET Gamecenter noted that the game was part of a trend of role-playing successes that month, alongside Ultima Online and Lands of Lore 2: Guardians of Destiny. He remarked, "If October's list is any indication, RPGs are back." Fallout totaled 53,777 sales in the United States by the end of 1997. Worldwide, over 100,000 units of the game had been shipped by December, and Erik Bethke later reported sales of "a little more than 120,000 units" after a year on shelves. By March 2000, 144,000 copies of the game had been sold in the United States alone. GameSpot's writer Desslock called these "very good sales, especially since the overall [worldwide] figures are likely double those amounts". Conversely, Fallout was unpopular in the United Kingdom: the game and its sequel totaled just over 50,000 combined lifetime sales in the region. 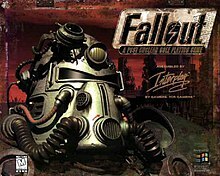 According to Brian Fargo, sales of Fallout ultimately reached 600,000 copies. Fallout was met with a very favorable critical reception. Computer Gaming World called it "a game that clearly was a labor of love ... with humor, style, and brains to spare, and with a wonderfully refreshing emphasis on character development and decision making". GameSpot's reviewer wrote that "character creation system is detailed and thorough" . Todd Vaughn of PC Gamer US wrote that the game's "tightly integrated mix of combat, storytelling and puzzling keeps the pace brisk and lively, and it'll keep you coming back for more". According to Computer Games Strategy Plus, "in an age where many are predicting the death of traditional RPGs at the hands of multiplayer extravaganzas, Fallout is a glowing example of the genre, one which positively radiates quality". The Academy of Interactive Arts & Sciences nominated Fallout for its "Personal Computer: Role Playing Game of the Year" and "Outstanding Achievement in Sound and Music" awards, but gave these prizes to Dungeon Keeper and PaRappa the Rapper respectively. Similarly, the Computer Game Developers Conference nominated Fallout for its "Best Adventure/RPG" Spotlight Award, but this went ultimately to Final Fantasy VII. However, Fallout was named the best computer role-playing game of 1997 by Computer Gaming World, PC Gamer US, GameSpot and Computer Games Strategy Plus. It also received GameSpot's "Best Ending" prize. The editors of Computer Gaming World summarized it as "quite simply the best RPG to hit the PC in years". In retrospect, CNET Gamecenter's Mark H. Walker wrote, "The RPG genre was clearly in a slump in the mid-'90s, but in August 1997 the renaissance began when Interplay's Fallout hit store shelves." Over the years since its release, Fallout was ranked as the fourth (2001), tenth (2005), 13th (2007), 21st (2008) and seventh (2010) best PC game of all time by PC Gamer, fifth (2007) and 19th (2009) top PC game of all time by IGN, and 21st (2007) best PC game ever by PC Zone. IGN also ranked it as the 55th (2005) and 33rd (2007) top video game of all time overall, as well as the 34th top RPG in 2013. Fallout has been inducted into "Hall of Fame" or equivalent of Computer Gaming World, GameSpot, GameSpy, and IGN, among others. In 2012, Fallout was exhibited as part of the Smithsonian American Art Museum's "The Art of Video Games" exhibition under the category of "adventure" games (along with Fallout 3). In addition, Fallout was included on the lists of top ten best endings and best game worlds by GameSpot in 2000, and top openings by Game Informer in 2008, while Polish web portal Wirtualna Polska ranked it as the sixth most addictive classic game. ^ Cheong, Ian. "Game Info". Lionheart Chronicles. GameSpy. Archived from the original on 2006-05-07. Retrieved 2006-07-25. ^ "The Top 100 Game Creators of All Time - 89. Feargus Urquhart". IGN. 2008. Archived from the original on April 12, 2016. Retrieved November 10, 2015. ^ a b "The Top 100 Game Creators of All Time - 85. Tim Cain". IGN. 2008. Archived from the original on July 4, 2016. Retrieved November 10, 2015. ^ a b Rollings, Andrew; Adams, Ernest (2003). Andrew Rollings and Ernest Adams on game design. New Riders. pp. 108, 357–360. ISBN 1-59273-001-9. ^ Ostroff, Joshua (December 15, 2015). "The Game After: A Brief History of Fallout 4's Post-Apocalyptic Retrofuture". Exclaim!. Archived from the original on August 14, 2016. Retrieved October 8, 2016. ^ Rollings, Andrew; Adams, Ernest (2003). Andrew Rollings and Ernest Adams on game design. New Riders. pp. 108, 357–360. ISBN 1-59273-001-9. ^ a b c d e f "G.U.R.P.S.". Next Generation. No. 18. Imagine Media. June 1996. pp. 74–76. ^ "Fallout Classic Revisited". GameSpot. 9 March 2012. Archived from the original on 14 January 2013. Retrieved 6 June 2012. ^ Barton, Matt (2007-02-23). "Part 2: The Golden Age (1985–1993)". The History of Computer Role-Playing Games. Gamasutra. Archived from the original on 2016-03-27. Retrieved 2009-03-26. ^ "Back To Black Isle: Fargo On Obsidian Joining Wasteland 2". Rock, Paper, Shotgun. Archived from the original on 2012-11-12. Retrieved 2012-08-28. ^ Matt Barton (June 27, 2010). "Fallout with Tim Cain, Pt. 1". Matt Chat. Episode 66. 647 minutes in. Armchair Arcade. Archived from the original on December 20, 2016. ^ a b Pitts, Russ (3 Mar 2012). "Fallout: The game that almost never was". Polygon. Archived from the original on 2013-10-20. Retrieved 19 Oct 2013. ^ a b "IGN Presents the History of Fallout". IGN. 2010-07-21. p. 3. Retrieved 2015-08-02. ^ "Daily Illuminator, February 19, 1997". Steve Jackson Games. 1997-02-19. Archived from the original on June 24, 2015. Retrieved 2015-08-02. ^ "Daily Illuminator, March 14, 1997". Steve Jackson Games. 1997-03-14. Archived from the original on September 24, 2015. Retrieved 2015-08-02. ^ Fallout Classic Revisited on YouTube Archived 2013-01-14 at the Wayback Machine, GameSpot, 9 March 2012. ^ a b Avellone, Chris (2002-11-06). "Fallout Bible #9". Black Isle Studios. Archived from the original on 2007-06-12. Retrieved 2007-06-16. ^ Staff (October 10, 1997). "Now Shipping". PC Gamer US. Archived from the original on October 12, 1997. ^ "Fallout Trilogy". IGN. Archived from the original on November 2, 2011. Retrieved July 20, 2011. ^ "Fallout/Fallout 2 [Dual Jewel]". Gamervision. 2001. Archived from the original on October 6, 2011. Retrieved August 17, 2011. ^ a b GamerX (November 26, 1997). "October's Best-Sellers". CNET Gamecenter. Archived from the original on February 10, 1999. ^ Schiesel, Seth (December 8, 1997). "Behold! A Role-Playing Game!". The New York Times. Archived from the original on April 5, 2018. ^ Bethke, Erik (January 25, 2003). Game Development and Production. Wordware Publishing. p. 16. ISBN 1556229518. ^ Suciu, Peter. "Fallout – Review". allgame. Archived from the original on November 14, 2014. Retrieved 2009-11-08. ^ a b Green, Jeff (November 19, 1997). "Fallout". Computer Gaming World. Archived from the original on August 16, 2000. ^ Butcher, Andy. "Glowing". PC Gamer UK (56). Archived from the original on January 17, 2001. ^ Cooke, Mark (June 5, 2004). "Fallout review for the MAC". Game Revolution. Archived from the original on July 24, 2008. Retrieved 2009-11-08. ^ Desslock (November 21, 1997). "Fallout Review". GameSpot. Archived from the original on October 16, 2013. Retrieved 2009-11-08. ^ a b Vaughn, Todd (January 1998). "Fallout". PC Gamer US. Archived from the original on March 12, 2000. Retrieved April 14, 2010. ^ a b Mayer, Robert (1997). "Fallout". Computer Games Strategy Plus. Archived from the original on December 17, 2002. ^ Staff (February 1998). "Rating; Fallout". Next Generation (38): 120. ^ a b c Staff. "Best & Worst Awards 1997". GameSpot. Archived from the original on February 8, 2001. ^ a b Staff (January 19, 1998). "The winners of the 1997 Computer Games Awards". Computer Games Strategy Plus. Archived from the original on February 6, 2005. ^ "Fallout for PC Reviews". Metacritic. Archived from the original on July 16, 2016. Retrieved July 15, 2016. ^ "Fallout Review". Retrieved 22 February 2019. ^ "PC Gamer's Best 100". PC Gamer. August 13, 2007. Archived from the original on June 21, 2010. Retrieved 2010-11-15. ^ "PC Gamer's Top 100". PC Gamer. August 5, 2008. Archived from the original on August 7, 2009. Retrieved 2010-11-16. ^ "PC Gamer's top 100 PC Games of all time". PC Gamer. February 5, 2010. Archived from the original on June 15, 2011. Retrieved 2010-11-15. ^ Adams, Dan; Butts, Steve; Onyett, Charles (2007-03-16). "Top 25 PC Games of All Time". IGN. Archived from the original on 2009-02-18. Retrieved 2009-03-20. ^ Ocampo, Jason; Butts, Steve; Haynes, Jeff (August 6, 2009). "Top 25 PC Games of All Time". IGN. Archived from the original on March 5, 2010. Retrieved 2010-01-03. ^ "The 101 best PC games ever". PC Zone. May 20, 2007. Retrieved 2010-11-15. ^ "IGN's Top 100 Games". Top100.ign.com. Archived from the original on 2009-02-27. Retrieved 2013-11-16. ^ "IGN Top 100 RPGs (Fallout)". IGN.com. Archived from the original on December 8, 2013. Retrieved December 18, 2013. ^ "CGW's Hall of Fame". 1UP.com. Retrieved 2010-11-17. ^ "The Greatest Games of all Time". Archived from the original on 2010-04-14. Retrieved 2010-11-17. ^ Buecheler, Christopher (December 30, 2000). "The GameSpy Hall of Fame: Fallout". GameSpy. Archived from the original on November 15, 2010. Retrieved 2010-11-17. ^ "IGN Videogame Hall Of Fame: Fallout". IGN. 2008. Archived from the original on 2011-06-29. Retrieved 2010-11-20. ^ "Internet Archive Wayback Machine". Web.archive.org. 2000-03-02. Archived from the original on 2000-03-02. Retrieved 2012-08-28. ^ "Internet Archive Wayback Machine". Web.archive.org. 2004-10-26. Archived from the original on 2004-10-26. Retrieved 2012-08-28.